We're currently in the middle of an explosion in noise-cancelling, Bluetooth headphones. But you probably can't hear it, because the noise cancelling is so effective. 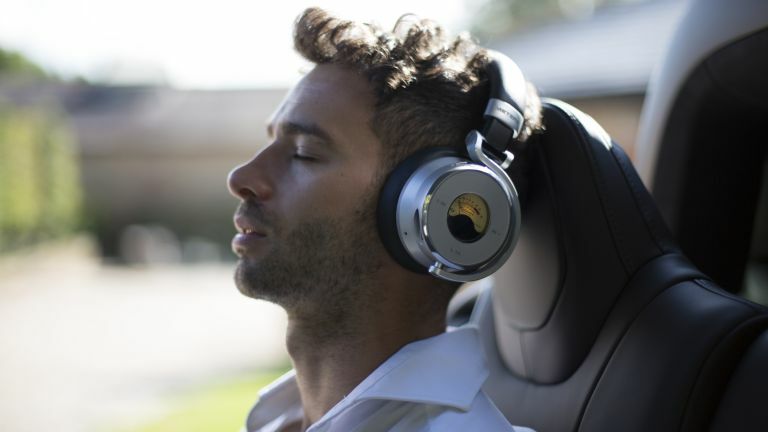 Meters' OV-1 features in our ever-changing guide to the best noise-cancelling headphones you can get but they felt a bit passé even at launch because they're wired rather than Bluetooth like the Bose QC35, Bowers & Wilkins PX, and the rest of the new, racket-quelling breed. So guess what? Now there's a wireless version and it's packing Apt-X HD Bluetooth for 'better than CD quality sound' from compatible devices. The OV-1B is visually very similar to its totally wired daddy, the OV-1. It's got the same plush leatherette ear cups in tan, black or white. Very similar, machined aluminium with rose gold or silver accents. Absolutely massive, backlit peak meters on BOTH ears. Yes, that was it. Meters may not make the best known headphones in the world, but they do probably make the most distinctive, even compared to Marshall. The peak meters really are fully functioning; they flick up and down to reflect volume changes in your music. We at T3 love this, because we are fly individuals who are very self-confident about our personal image. If your style is a little more muted, maybe it's not for you. We don't know. What we do know is that the wired Meters OV-1 had generally excellent sound with the active noise cancelling (ANC) turned off, but took a bit of a sonic dive with it turned on. The OV-1B features Apt-X HD compatibility so audio should remain impressive despite snipping the wire (well, not entirely – you can revert to wired connectivity via a plug-in 3.5mm cable if you prefer). If Meters have also buffed up the ANC a bit, these flagship cans could hit new – aha-ha-ha – 'peaks'. But we'll make a call on that when we get a pair to – ho ho! – re-'VU'. Zing! Meters OV-1B is available from November for an only slightly wince-inducing £329.